The role of a social media marketer is now more in demand than ever before. Managing a social media platform takes a unique alchemy of skill, experience, insight and the ability to think outside of the digital box. Having said this, the ultimate goal is still the same. It is to successfully present the product or service of a particular business to the intended audience. Working smart as opposed to hard will breed success. Working smart heavily involves the concept of productivity in social media marketing. Let us look at some of the ways that this essential feature can be leveraged to produce viable results. What are the short- and long-term targets? How will social media help to address these goals? What is your intended demographic? What type of brand identity do you hope to establish? Examining each of these questions will enable you to place your focus in the correct direction; minimising wasted efforts and vastly increasing productivity. One of the most pragmatically useful tips is to plan the release of your content around a predetermined schedule. Many would-be marketers tend to become quickly overwhelmed with when to post, how often and on which sites. This will ultimately lead to confusion and lower levels of productivity. There are several social media tools which can help with the planning aspect of content and when it should be publicly released. Social marketing should always involve the latest productivity engines and CMS platforms. Unfortunately, there are many times marketers use the wrong medium. To be at fault with channels or tools can result in lots of confusion, and ultimately, PR campaigns will suffer. Choosing the best portal for your specific needs is critical. Each should boast a user-friendly architecture, and ideally, it should be scalable so that you can add or subtract different sections as might be required in the future. The basis of any productive campaign in digital marketing always involves laying a firm groundwork. Many of the most efficient media campaigns are the products of collaborative thinking and a well-oiled team. Communication is therefore essential so that each member can express his or views to the others. Thankfully, the majority of marketing platforms will allow you to delegate certain tasks to specific stakeholders based off of their skills and expertise. It is still critical to point out that relying upon these systems alone can be dangerous. It is the responsibility of the team leader to make certain that everyone is actively involved and meeting the appropriate deadlines. Social media marketing productivity also involves setting up clear steps towards achieving a clear goal. Examples can be hitting certain sales targets, gaining a particular number of followers or surpassing revenue figures from the previous financial quarter. The main takeaway point is that defining the steps involved will provide all stakeholders with a clear course of action. Another benefit is that checklists and other step-by-step guides can help to highlight any potential problem areas within a campaign. Related: Advanced Data Analytics: One of our Data-Sets is Missing! In this sense, we are referring to the distractions that can be caused by news feeds about marketing tasks. It is quite easy to lose focus while working if we happen to come across a site’s or friend’s update or an interesting third-party article. Distraction can be the downfall of what would have otherwise been a productive activity. Remaining focused on the one task at hand is critical. If this proves nearly impossible, there are numerous software algorithms which will block the incoming newsfeed. Even the most experienced marketing specialists will outsource specific tasks to third-party firms and similar consultants. Outsourcing will often involve ancillary concerns such as content calendars, customer service enquiries or blog and social media updates. The key point here is that the overall levels of productivity will be streamlined if the experts can devote more of their time to the core metrics involved with a project as opposed to tackling countless responsibilities to no avail. These are some of the most efficient ways to increase social media marketing productivity within the existing workplace. Each should be implemented alongside the others so that the overall impact is more pronounced. The expression “time is money” is certainly appropriate here. 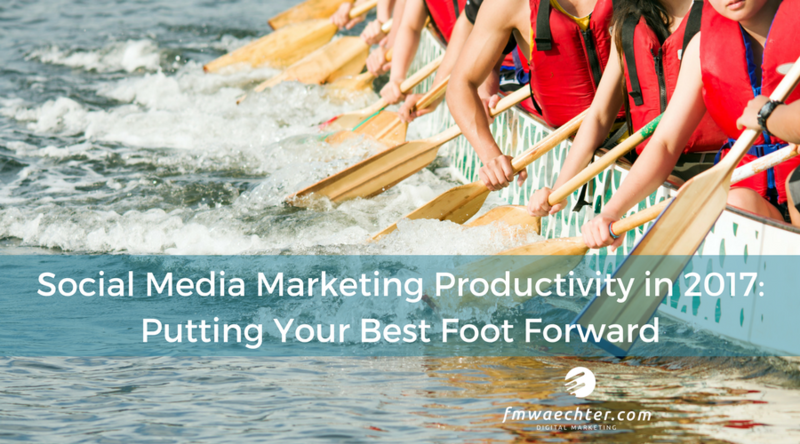 The post Social Media Marketing Productivity in 2017: Putting Your Best Foot Forward was first published on fmwaechter.com. Author Frank M. Waechter.